Braille This Transcription service will take your print materials and transcribe these materials into an accessible Braille format for the Braille reader. Our emphasis is on quality professional transcription of your print materials into Braille while providing attentive customer service. Your print materials will be transcribed into Braille, embossed and proofread by an experienced certified Teacher of the Blind. You Send it, We’ll BRAILLE it! Our Specialty is transcribing your print materials into Braille from a; print copy, flash drive / memory stick or email sent in a Doc, or PDF format. Print hard copies or flash drive / memory sticks are preferred with large embossing orders. We offer un-contracted (Grade 1) or Contracted (Grade 2) embossed Braille materials. We offer single sided or inter-point (double sided) embossed Braille materials. Binding service is also offered, that includes a 19 ring binding comb with plastic front and back covers. Inter-lining Services WE OFFER inter-line services: We will take your Braille materials/books and transcribe it back into print (by hand) above the Braille format. This service is especially useful for teachers/Para professionals in the school setting. 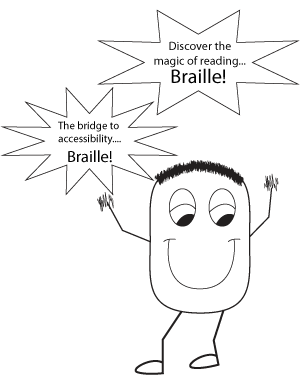 Interlined Braille allows the sighted (non-Braille user) the ability to read along and support the student during educational lessons. Interline services are $0.50 per page. Please call for additional information on this service. Now, you can follow us at www.facebook.com/BrailleThis for quotes, tips, favorite specialized materials and more related to low vision and blindness. “Like” us today and view our favorite posts exclusively for our Facebook friends. You can also follow us at www.pinterest.com/braillethis for resources and more for the low vision and blind individual!